As the summer season came to an end in early November the number of tourists in Sicily has dropped, thus reducing the amount of tours on Etna. White snow now lies over the black ash and lava changing the appearance of the Volcano dramatically, and it won’t be long until the slopes are filled with skiers and snowboarders. This break in tourism has allowed us to further develop our knowledge of the Volcano, as well as explore some areas we have never seen before. We have been able to delve deeper into the massive Valle Dell Bove which has changed our perspective completely. We’ve explored different caves and visited more natural and isolated areas around the Volcano. All this new information has really helped us understand Etna and has made it a lot easier when explaining things to visitors about it. Outside of working hours we’ve continued to explore the eastern coast of Sicily and even took a trip down to the southern city of Syracuse although the day was cut short by a rain storm, something we haven’t seen much of during our time here. 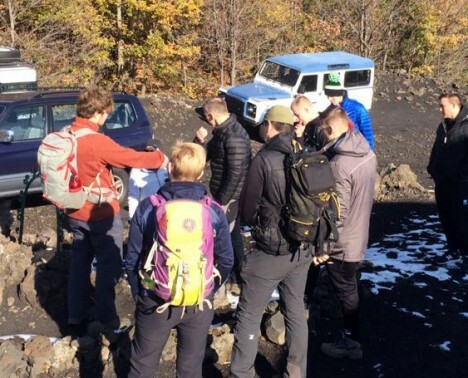 We’ve also continued to socialise in the evenings with friends and take on some really tough treks around Etna. There has been opportunity for us to practice what we have learnt, and a few weeks back Walter and I led our first independent excursion. Seven tutors from various colleges came to Sicily to take a look at the project Walter and I are currently partaking in as well as to plan future projects with Etna Finder. It was up to us to firstly make sure they were safe as well as provide them with information about Etna and Sicily as a nation. It felt great to take what I’ve learnt and really do something with it. After a couple of nervous moments I think we both did brilliantly and the tutors really seemed to enjoy themselves. Although they weren’t paying customers as such, I think it has set us both up perfectly for a successful summer season! This break in work has also allowed us to fly home for a month at Christmas to see friends and family. I’ve really enjoyed my time back in England but I’m really excited to get back to Sicily and hopefully try and enjoy some of the ski season!